Crude Oil is a mixture of hydrocarbons. 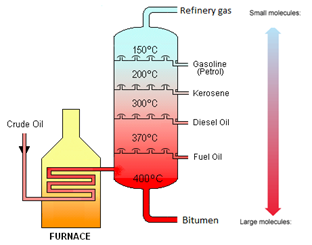 Crude oil is separated by fractional distillation. Crude oil is heated and the oil evaporates. It then goes into the tower. As the vapours rise up the tower the temperature falls. Different sized fractions condense at different heights because they have different boiling points. Smaller molecules condense high up the tower. Larger molecules condense low down in the tower. Crude oil is separated into fractions by the process of fractional distillation. The boiling point increases as the number of carbon atoms (chain length) increases. The viscosity increases as the number of carbon atoms (chain length) increases. Refinery gases Smallest molecules. Lowest boiling point. Lowest viscosity. Bitumen Largest molecules. Highest boiling point. Highest viscosity. A fuel is a substance that, when burned, releases heat energy (exothermic reaction). Carbon monoxide is poisonous because it reduces the capacity of the blood to carry oxygen. Acids formed in the atmosphere can fall as acid rain. This can be a major problem, killing trees and fish in lakes. The acid rain also corrodes limestone buildings and marble statues since these are both made of calcium carbonate (CaCO₃). Some metals such as iron are also attacked by acid rain. In the atmosphere these nitrogen oxides can produce nitric acid (HNO₃). Cracking converts long chain hydrocarbons into short chain hydrocarbons. Long-chain alkanes are broken down into alkanes and alkenes of shorter length. Crude oil contains a surplus long chains. Shorter chain hydrocarbons are in greater demand, e.g. petrol. Cracking also produces alkenes which are used in making polymers and ethanol.